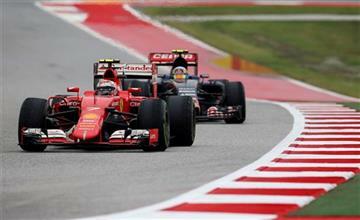 With Formula 1 still trying to cement its reputation in the USA, a good race was needed to maintain the positive momentum the Circuit of the Americas has built up over the past couple of years. Instead of a good race, we got a cracking race! The drama began with drenched practice sessions, the result of the powerful storms lashing at Mexico and spilling over into Texas. It was proving virtually impossible to get any decent amount of laps in, with the weather getting bad enough so as to force the early end to Friday’s sessions. On Saturday, the inclement weather continued, delaying qualifying to the stage where it was cancelled altogether, with the hope of squeezing it in on Sunday morning. Qualifying did indeed take place early on Sunday, but only Q1 and Q2, as the rain was still heavy enough to rule out Q3. The result of this? Nico Rosberg would start on pole for the third successive race. 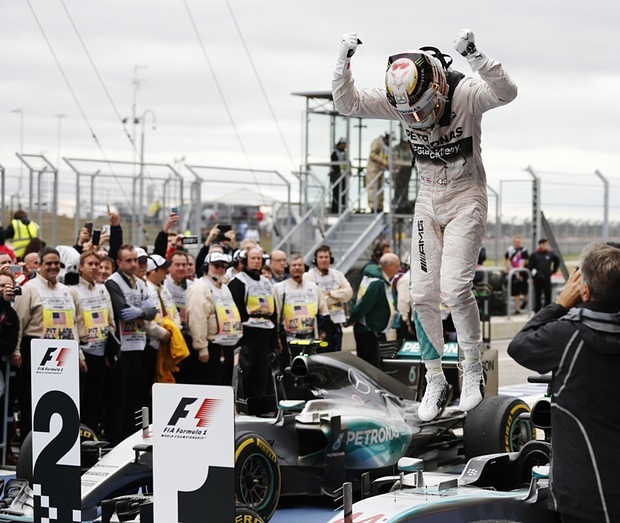 It was an important pole for Rosberg, who needed to best Hamilton to have any remaining hope of winning the title. Hamilton would line up second on the grid, and the Red Bulls would line up behind them, having shown good pace in the damp conditions (which had eased enough to allow for intermediate tyres by the time the race started). 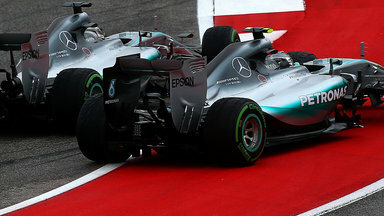 When the lights went out, Hamilton charged from the line, getting alongside Rosberg almost immediately, and he would squeeze Rosberg hard as the pair of them reached turn 1, forcing the German off the track and briefly down to fifth (though Rosberg would be back up to fourth very quickly). I was quick to defend Hamilton after he pulled a similar move on Rosberg in Japan, but this was more aggressive, borderline wrong. If Lewis expected the race to be plain sailing from then on, he was to find himself sorely mistaken. The Red Bulls of Kvyat and Ricciardo were maintaining a steady chase, actually challenging Hamilton, whilst Rosberg would keep on their tails, and an absorbing four-way scrap for the lead began. Inexplicably, Williams’ Valtteri Bottas pitted for dry-weather tyres very early, ending his hopes of any points (ultimately, both he and Massa would retire). As the race progressed, the track did indeed start to dry out, but the leading foursome kept their intermediate boots on, maintaining a steady gap to the rest of the pack. With the dueling taking place between the leaders, it was unsurprising that the lead kept changing hands. At one stage Kvyat, whilst attempting to get by Rosberg, flew wide as they came out of the final corner, and Rosberg was aggrieved by what he felt was a dangerous move by Kvyat to rejoin the track. 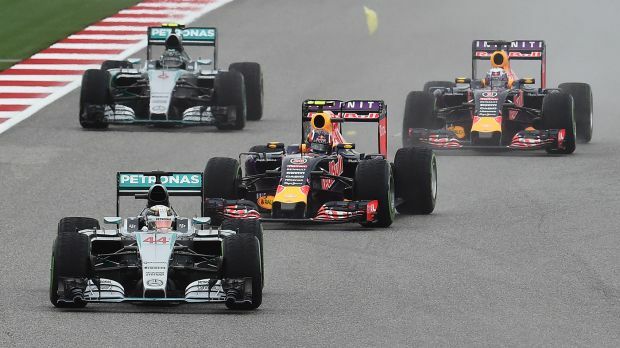 Shortly afterward, Ricciardo got by Hamilton for the lead, and began to pull away, whilst Rosberg started to put Hamilton under pressure. There was also some good action going on further back. Sebastian Vettel had enjoyed a fantastic start, rising from 13th to seventh, and ultimately to fifth, whilst the Toro Rosso of Max Verstappen was entangled in a terrific scrap with Ferrari’s Kimi Raikkonen, who was complaining of strong-arm tactics from the teenager. Meanwhile, Verstappen’s teammate Carlos Sainz, who had started last after a shunt in qualifying, was up to ninth, also getting involved in the fight between Raikkonen and Verstappen. Raikkonen would ultimately bin his Ferrari, sliding off into the barriers, but managing to keep his car going and soldiering on – the damage to his brake ducts would, in the end, finish his race early. After 22 laps, Ricciardo was leading, with Rosberg hunting him down and Kvyat was third, managing to keep ahead of Hamilton. A few laps later, the Mercedes duo were one and two, with Rosberg having built up a decent lead, but a retirement for the Sauber of Marcus Ericsson would alter the dynamic of the race. The safety car wiped out Rosberg’s advantage, and the top four all made the seemingly baffling decision to stay on soft tyres (having pitted for dry tyres by this point), whilst Vettel behind them made what was at the time the inspired move to pit for mediums – that could in theory get him to the end of the race. There was the very real possibility he could win, as it was inevitable the top four would have to stop again, their tyres simply unable to last. When the safety car pulled in, Vettel got the jump on Kvyat, and would soon after get by Ricciardo after a brief battle, but the Mercedes were starting to stretch their legs, whilst the Red Bulls were starting to struggle as the track continued to dry out. Verstappen had crept up to fourth, whilst a front-wing failure for Force India’s Nico Hulkenberg saw him hit Ricciardo as they fought for fifth place. Ricciardo was able to continue, but Hulkenberg was out. The virtual safety car was triggered, and Rosberg pitted almost immediately, but Hamilton, bizarrely, didn’t. Vettel and Verstappen, along with the the Red Bulls, also didn’t pit, and it seemed that Hamilton’s failure to pit, combined with Rosberg being on fresh tyres, would hand the race to Rosberg – delaying the title for at least another week for Hamilton. All though, was not how it seemed. Kvyat would spin and smack into the barriers just before the final corner, triggering another safety car spell, and this time, Hamilton did stop, as did Vettel, who didn’t have the pace he wanted on the mediums. Hamilton rejoined in second, and when the race resumed, he chased after Rosberg, knowing if he could get by him, the title was his. Rosberg initially pulled away, but Hamilton began to reel him in, slowly but surely. Verstappen had found himself in third at the restart, but was powerless to stop Vettel getting by him, so settled in, poised to equal his best F1 finish so far. It was by no means certain that Hamilton would catch and pass Rosberg, but on lap 49 Rosberg would hand the race – and the title – to Hamilton on a platter. He lost the rear tyres coming out of turn 14, swinging wide, and Hamilton did not need another invitation. So, Hamilton would take his 43rd career win, and claim his third world title with three races to spare. On top of that, he is the first British driver to win back-to-back titles – a tremendous achievement, and he can rightfully very proud! For Lewis, this can only be described as a huge milestone. He has emulated his idol and hero Ayrton Senna in winning three world championships, and it was clear this was an emotional moment for him – he sounded like he was in tears on the team radio after he’d crossed the line. Everyone will start dissecting the season, even with three races remaining, and for Lewis, attention will probably turn to 2016 very soon. Likewise for Nico Rosberg, who was clearly annoyed at missing out on a win, having gifted it to Hamilton. The title was almost certainly lost anyway, but with a chance to at least show some fighting spirit, Rosberg bottled it. He will almost certainly be turning his eyes to 2016 too, wondering what he needs to do to beat Hamilton (having now finished behind Lewis in the 2013, 2014 and 2015 standings). 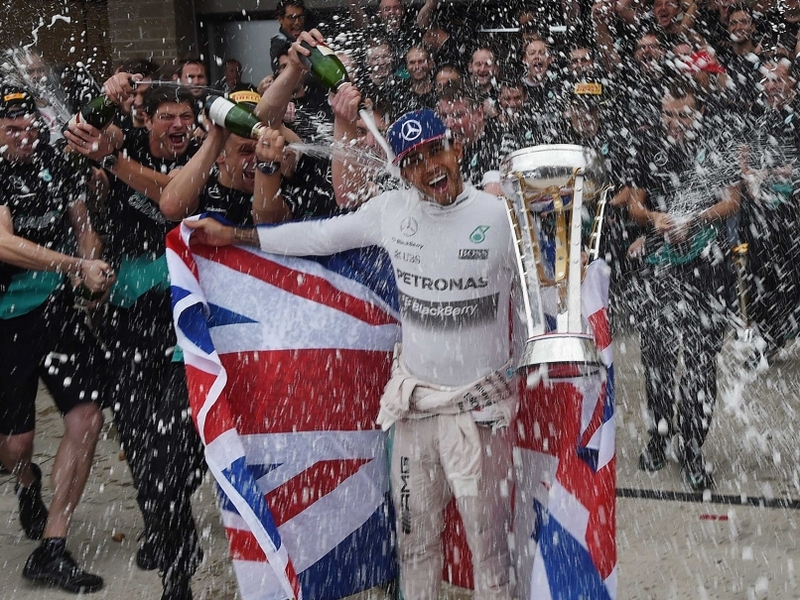 What Hamilton will do for the immediate future, is celebrate – he has certainly earned that right!